This special edition giclée on canvas print forms a diptych with Family Love. The paintings Fire Within # 2 and # 3 are both mirror images of a canvas I did back in 2012, titled The Fire Within #1 and I tried to capture the essence of the first piece. 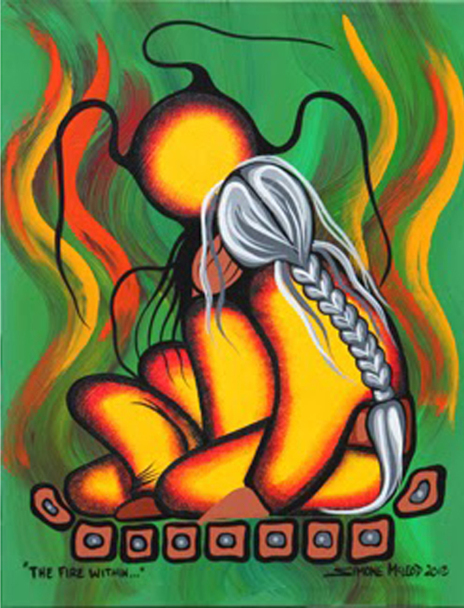 The colors and forms in the background conjure up images of WAAWATE, or NIIMIDIWAG, the northern lights, which are said to be the reflection of the campfires with which the spirits of the grandfathers that left the earth illuminate the northern skies.